Our forms for Scouting and Self-Assessment in The Virtual Salle are now operational and can receive your tournament data. And we have added a tournament form with the pre-competition checklist to let our coaching staff know that you have registered for a tournament and to request any needed equipment. The foil event of the Spring Relay ended on Sunday, 20 March. Results: Fred Vegas 1st (Gold medal) (25 touches scored), Frank Markham 2nd (Silver Medal) (15 touches scored), Nate Letteri 3rd (Bronze Medal) (13 touches scored), Sean Moore 4th (12 touches scored), Janie Engel 5th (1 touch scored). 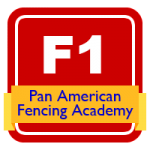 Congratulations to Frank Markham for successful completion of the written and practical examinations for Level 1 in Foil in the Pan American Fencing Academy Skill Development Program. 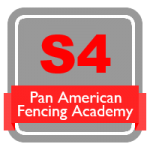 And a belated congratulations to Brian Ainley for earning Level 1 in Foil last month.